No Man’s Sky’s vast universe was part of its initial appeal. You would go from planet to planet, completely alone, discovering and naming things along the way. 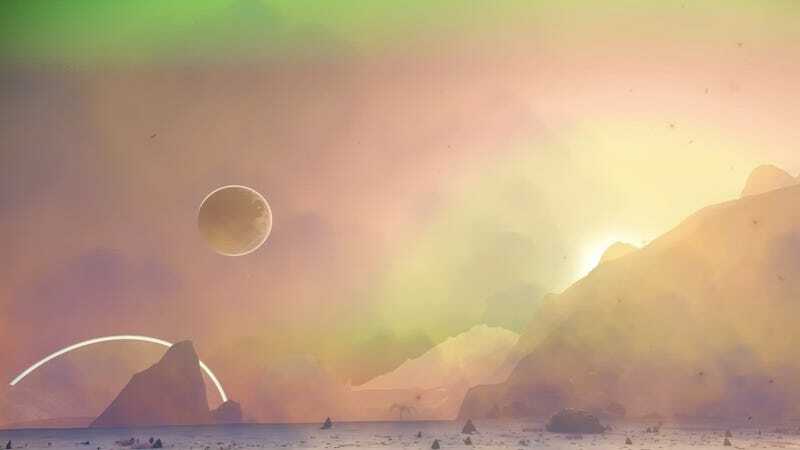 For some players, that was too desolate, so they banded together to make the Galactic Hub, a portion of No Man’s Sky that acted as a home base. After the most recent update, those established trade routes, farms and bases became unrecognizable. So, the community leaders of the Galactic Hub had to find a new home for their adventures. “Near” and “far” are relative terms in a game like No Man’s Sky. Some players might spawn very close to Lennon, while other spawn very far from it. No matter the distance, however, joining the hub was an active choice, and required some legwork to get there. Warping into Lennon and then visiting the capital planet, Drogradur, was a right of passage for players who grinded their way to the hub. When you made it there, what you’d find was an organized, helpful community to welcome you. Against all odds, the Hub managed to cultivate over 5,000 passionate players who located and marked useful items for incoming players, like multitools and ships, and even set up community farms that everyone could tend, harvest and use for trade. If you decided to jump into Lennon and join the hub, you would know that you were joining a real, working civilization that could net you not just good tools and lots of credits, but people who would show you the ropes and maybe even become your friends. Then 1.3 came, and things changed. The reliable landmarks of the Hub have now also changed, as well as the flora and fauna. 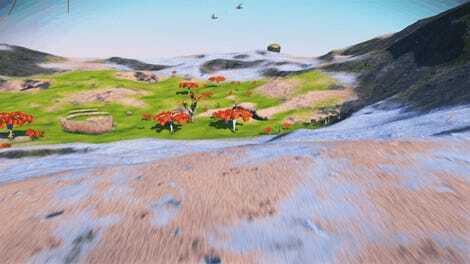 “Our capital planet, Drogradur … turned into a frozen wasteland after a long time as a tropical beauty,” 7101334 said. 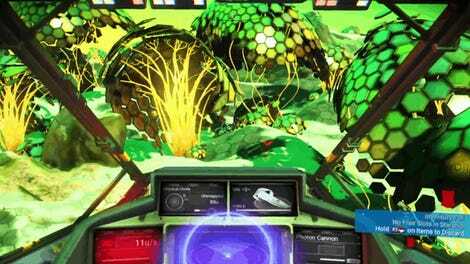 7101334, who is also the leading expert on animals in the Galactic hub, or the Lead Exozoologist, also said, “We think the mighty Caesarus, largest fauna species ever discovered in No Man’s Sky, has gone extinct.” Planets that were were scanned prior to the update will still list those plants and animals as living there if you check the in-game discovered species, but 7101334 and other members of the hub simply have not seen a Caesarus since the update hit. Post update, the Hub was just unrecognizable. “My base sat within shouting distance of two trading posts, a portal, different kinds of cool rock formations. I thought it was a great place and I was excited to continue into 1.3 from there,” Scott said. “The reset turned it into a barren planet with completely different geography. That was the most disappointing thing, just seeing that this place I had gotten to know very well was just gone.” But rather than dwell on the things they’d lost, Scott, 7101334 and their compatriots decided to make a bold move into the future. Very quickly, council members got attached to a region called the Shungka Void. From there, a few members of the council scouted out systems and planets and sent pictures back to the rest of the council, who were all head down in the logistical work of preparing new systems and databases for a community of several thousand people. In speaking to the members of the Galactic Council, you might feel like you’re talking to a futuristic space government. Logistically, the move took a lot of work, especially in terms of creating a new wiki for the Hub from the ground up. The Wiki was a valuable resource for players, obsessively catalogued with every discovery. In order to move, they’d have to update this resource for the Shungka Void. The people who came together to do that included Scott, a No Man’s Sky cartographer who made maps of the stars to help players navigate space; Seamonkey420, who wrote a script to help players fill out Wiki pages, as the Wiki would have to be entirely rebuilt; pahefu, who has made an app to convert glyphs into planet coordinates; and of course Hub founder 7101334. There are 19 people in the Council, and they spent a week together reworking old systems and preparing the community for the move. It was a fast moving, passionate Discord group. “It would take about 5 mins to catch up if you went away for an hour,” Seamonkey420 said. Scott told me that between the council and his full time job, he wasn’t sleeping much. Because No Man’s Sky is a game that’s still in flux, the council tried to create systems that would grow as the game continued to be updated. It wasn’t conflict free—there were disagreements over how new planets should be named—but the council was able to complete the move six days faster than expected by working together, according to 7101334. Scott described this as bittersweet. “We really enjoyed the stuff that we’d done in the old hub, but we’re excited to start things in the new place,” he said. “A lot of this was sort of experimental, to get an idea for what we were doing and now we can do it really right the second time.” The conversation felt a little like talking about graduating from college. “The best part of the last update was the photo mode… I’ve got this huge album of everything I’ve explored and everything I’ve done,” he said. “The way we cope with it is approaching it from that point of view. Yeah we did that, but it’s gone now. Now we get to do it again, in this new place. More than sadness or nostalgia, these council members are very excited to see their new systems in action, find new flora and fauna, and make new bases. 7101334 hopes that this move will help the Galactic Hub community flourish into a kind of Renaissance, where the Galactic Hub can have a stronger sense of identity. “I want the Galactic Hub’s to develop more of a culture, for the [players] and the regions and the systems to have more specific identities.” he said. “An extension of the class system will be themes for each region. For example, since I’m the Lead Exozoologist and Chancellor of Shungka Void, Shungka Void is “The Fauna Region”. Since 57Dynasty is the Lead Economist and Chancellor of Marmor Spur, Marmor Spur is “The Prosperous Region.’” In rebuilding the Galactic Hub, he hopes that it’s easier to understand for newcomers, who will flock to regions that suit their playstyle best.